The multibillion-dollar question: Who has jurisdiction over PG&E's power-purchase agreements? If Pacific Gas & Electric goes bankrupt, who gets final say over whether it can renegotiate its old and expensive solar power-purchase agreements — federal regulators or the bankruptcy court? This multibillion-dollar question has come to the fore as PG&E, overwhelmed by tens of billions of dollars in potential wildfire liabilities, prepares to file for Chapter 11 bankruptcy protection as early as tomorrow. Last week, PG&E solar provider NextEra asked the Federal Energy Regulatory Commission to use its authority under the Federal Power Act to order the utility not to “abrogate, amend or reject in bankruptcy any of the rates, terms and conditions of its wholesale power-purchase agreements,” including hundreds of megawatts of decade-old solar farms that are selling power at far above today’s market rates. Consolidated Edison, which counts PG&E as an offtaker for nearly one-third of its renewable energy portfolio, also weighed in last week to ask FERC to expedite NextEra’s request. Late Friday, FERC offered these companies a lifeline, with an order declaring that it has “concurrent jurisdiction” with federal bankruptcy courts over whether utilities in bankruptcy can breach their contracts. That’s important, because FERC would be looking at whether breaking a contract harms the “public interest,” a determination that could take into account the role that these PPAs play in maintaining progress on California’s clean energy and carbon reduction goals, as well as the business interests of the parties involved. 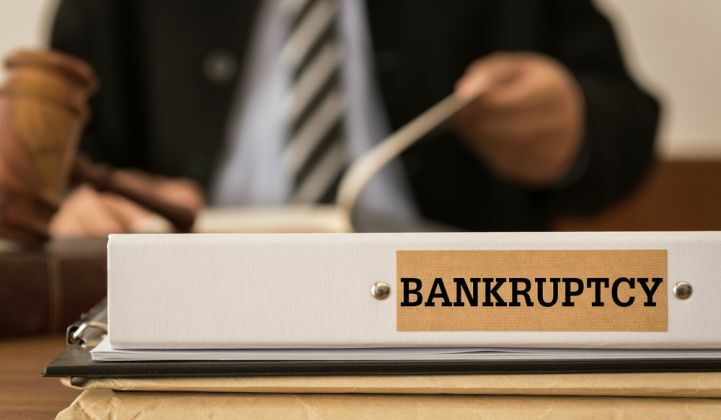 Bankruptcy courts use a much less stringent “business judgement” rule, which generally allows contracts to be breached if it would help the company to satisfy its creditors’ claims and complete its reorganization. These dueling legal arguments, lined up even before PG&E has taken the formal step into bankruptcy, could end up influencing billions of dollars in current PPA payments, as well as altering the economics of increasing California’s renewable energy portfolio in years to come. According to Credit Suisse, renegotiating its more than 7 megawatts of pre-2012 solar PPAs could save PG&E about $2.2 billion a year — a sizable source of money to help resolve the utility’s outstanding liabilities. But slashing the revenues of these projects by renegotiating these contracts could also drive up the costs of building new solar in the state. PG&E’s looming insolvency has already led to credit downgrades for some of its big legacy solar projects. Berkshire Hathaway Energy’s 550-megawatt Topaz solar farm’s credit rating was cut to junk status by S&P Global, and NextEra Energy’s 250-megawatt Genesis Solar project was downgraded by Fitch last month. Ongoing credit rating downgrades could increase the cost of new PPAs by 10 to 20 percent, as project developers absorb the losses of renegotiated PPAs by raising prices on new projects. Whether or not these kinds of future effects are taken into account depends in large part on which entity has final jurisdiction over how these contracts are dealt with in bankruptcy court. Unfortunately for those seeking certainty on this matter, legal precedent is somewhat conflicting, with recent federal court decisions that alternately uphold and deny FERC’s authority to intervene in bankruptcy courts’ disposal of utility power contracts. “The most recent case law has not been supportive of FERC’s authority to enforce continued satisfaction of PPAs” in bankruptcy, Rob Rains, analyst for Washington Analysis, wrote in a Sunday investors note. In 2003, FERC was able to successfully enforce a PPA for NRG Energy to provide power to Connecticut Light and Power after it declared bankruptcy, “in part because Connecticut state officials moved quickly to get the Commission involved,” he wrote. But in the 2004 case of Mirant v. Potomac Electric Power, the 5th Circuit U.S. Court of Appeals “concluded that FERC’s authority under the Federal Power Act did not allow it to supersede the bankruptcy proceeding,” he wrote. The Mirant decision would appear to inform last year’s decision by a federal court in Ohio that bankrupt utility FirstEnergy Solutions could breach several money-losing PPAs, overruling a counterargument from power plant owner Ohio Valley Electric Cooperative, finding that FERC had the authority to force FirstEnergy to maintain them. But as Rains noted, FERC did not respond to OVEC’s petition, and thus never made clear its stance in the matter, which is now under appeal at the 6th Circuit U.S. Court of Appeals. FERC’s late Friday order takes up these conflicting legal precedents, and concludes that it does share authority with bankruptcy courts over breaching PPAs, although over different aspects of the contracts. Specifically, FERC declared that parties to PPAs it regulates must get its permission to "modify the filed rate" of the contracts, while the bankruptcy court has jurisdiction over whether or not to reject the contract. Rains noted that FERC’s order “draws a tenuous legal conclusion that will likely require further interpretation by the courts.” He also noted that, despite the precedents that may be set by the Mirant and FirstEnergy cases, “the key case law associated with this question is not mandatory for the California federal courts." That creates even more uncertainty over how the coming conflict between PG&E and its most expensive PPA providers will play out.